Pain Specialists can help you find relief from chronic pain. Michigan Pain Specialists care for patients in our Ypsilanti pain treatment center just outside of Ann Arbor. The facility is an hour’s driving distance from Detroit, Lansing, Flint, and Toledo, Ohio. We’re also within a half day’s drive of Grand Rapids, Fort Wayne, Cleveland, Columbus, Cincinnati, Indianapolis, and even Chicago. 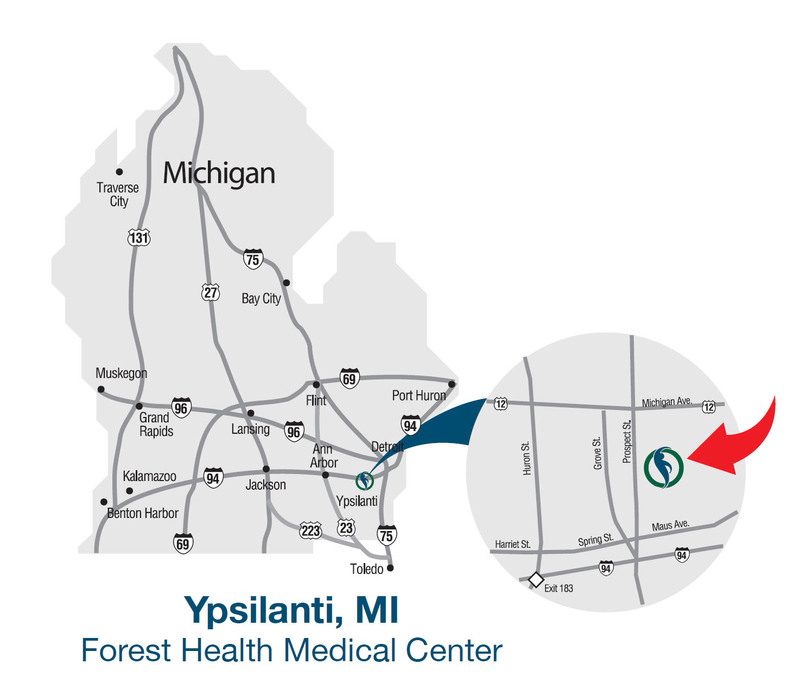 The pain center in Michigan is convenient and easy to find, located in the Forest Medical Health Center, close to I-94, US-23, I-96, I-275, I-696, and I-75. The area is also serviced by Detroit Metro International Airport, a 30 minute drive from the pain center. If you prefer to stay overnight, we’re located near a variety of hotels, restaurants, and area attractions, including Lake Erie and Lake St. Clair. In Detroit you and your loved ones can see major sports teams, catch a concert or other event, or visit a range of museums. At the Michigan Heilman Pain and Spine Care Center, you will be cared for by experienced, skilled professionals, from office staff to nurses, physician assistants, and doctors who specialize in Pain Care and Management. Contact us to discuss appointment times, insurance, and any questions you have about pain treatment options. The Michigan Pain Specialist doctors work to identify the root cause of your pain and develop a personalized treatment plan that makes sense for you. Our Michigan clinic is located in a hospital environment, where doctors have access to the latest diagnostic and treatment technology to deliver the highest standard of care for every patient. The search terms “pain treatment near me” may pull up multiple options. You may also live a little further from our center and wonder why getting a referral to us is a good choice — and that’s a fair question. Personal attention. At the Heilman Pain and Spine Care Center, you’re not just another patient; you’re a unique person with a unique medical history and unique treatment needs. Your Pain Specialist will listen carefully to understand both the physical cause of your pain and how pain is affecting your life. Your doctor will then work with you to create a pain treatment plan that gets you back to the work and activities you enjoy most. Doctors with advanced training in Pain Care. Doctors who have undergone rigorous higher education in Pain Management and Anesthesiology and are experienced in a range of advanced pain treatment procedures. And a support team with Physician Assistants and Nurse Practitioners who focus their continuing education on pain care. Non-drug treatment options whenever possible. The highest standard of care. We provide care in a clean, open hospital environment, with state-of-the-art diagnostic equipment, tools and medical expertise you expect in a hospital. The latest treatment options. From the latest innovations to tried-and-true treatments, your Pain Specialist doctor has multiple options at their disposal to provide you with the best possible care. Comprehensive services. From diagnostics to interventional treatments, you can receive all care in a single location, to simplify your life. Are you ready to visit our Michigan Pain Specialists? Do you have questions you’d like us to answer before scheduling a consultation? Call 888-683-0716 or use our online form to contact us today.